Punch Alert is an all-in-one mobile security and emergency communication platform that allows schools to proactively manage and resolve emergencies. Use for weather warnings, health emergencies, safety alerts, and announcements. Download the Punch Alert mobile application to your smartphones. School faculty, staff, and students with access can report emergencies, and internal responders act as gatekeepers and determine how to proceed. Punch Alert is the only way to report, manage and communicate en mass in one mobile-centric platform. 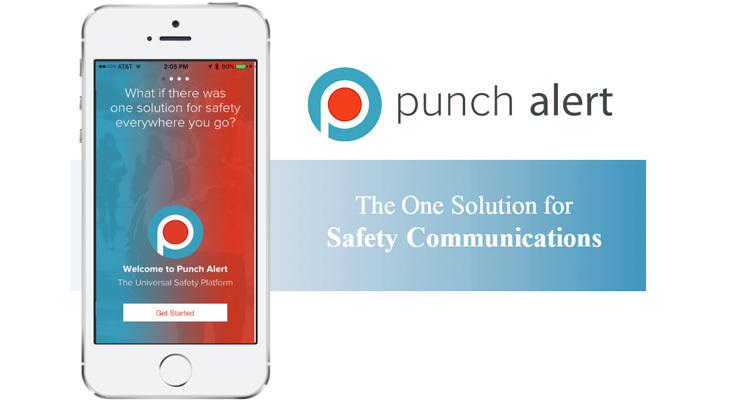 Punch Alert's mobile app turns any iOS or Android device into a mobile panic alarm. Employees and visitors are able to use their phones to report emergencies or suspicious situations to preselected emergency responders. Any user can submit information to emergency responders in the form of text notes, images, video or audio recordings. Punch Alert allows responders to easily and efficiently crowd source this information, and even redistribute warnings and announcements to everyone on campus as one mass notification. Instantly after an emergency is reported, responders receive an email, text message, and automated phone call with the name and location of the person who reported the emergency. Responders can screen emergencies as they come in, release them to specific users, distribute emergency plans, share content and updates, as well as resolve the emergency— all from their mobile device. indoor location of individuals during an emergency. Interested in learning more about how the Punch Alert can benefit your school?